The Miho Museum: time to resolve its dispute with Italy? If the striking advances recently achieved by the Italian authorities in combating the illicit traffic in looted antiquities are to be of wide general, indeed international value, a number of steps will be necessary. The first of these could be the formal and published acceptance of the 1970 Rule by museums and then by private collectors in all countries. The second should be the true internationalisation of such a position. 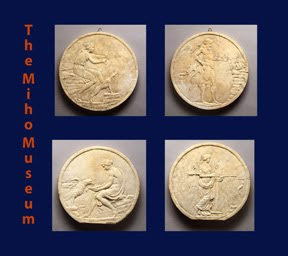 That would include, for instance, the recognition by Japan of its obligations under the 1970 UNESCO Convention, and the equivalent recognition by the Trustees of the Miho Museum of their own responsibilities. I do not imply here that the Miho Museum is alone in flouting the conventions of good conduct in this respect, but it is certainly prominent. And here it should be remembered that many museums, even private museums, have charitable status in relation to taxation. That status should be questioned by national authorities if the institution is seen to be flouting either international law or the widely shared ethical standards implied by the UNESCO Convention. Only then can progress be made. Details of the controversial acquisitions by the Miho Museum emerged in the Rome trial of Robert Hecht and Marion True in June 2007. The Italian prosecutors had images of a Roman marble oscilla. Although these are images that are likely to have been seized in the Geneva Freeport, there was a comparable dossier seized in Basel. Earlier reports have indicated that there are some 50 objects in the Miho Museum that are under investigation by the Italian authorities. (Other countries, including Iran, may also be looking at their collection.) There are also indications that some antiquities in the Miho Museum were supplied by Gianfranco Becchina. "We bought only from major dealers ... And we invited museum curators, scholars, collectors, restorers and dealers to look at the collection and urged everyone to tell us of any problems they saw." It would be interesting for the Miho Museum to declare the names of the major dealers who provided the antiquities for the collection. The Miho Museum needs to find a reasonable resolution with the Italian authorities or it will continue to be perceived as a museum that does not hold an internationally recognised ethical standard for acquisitions. we decided to investigate because we want to know the truth and serve our research purposes. The Shinji Shumeikai, the sect linked to the Miho Museum's founder, has as its values the "pursuit of truth, virtue and beauty". Now is the time for the Miho Museum to investigate the Italian claims with rigour. There is also a lesson for other museums that have been seeking to build up collections of antiquities in an age when the finite archaeological record has been under so much threat from looting and the illicit trade in antiquities. Composite of Roman marble oscilla in the Miho Museum that have no declared collecting histories.